Chongwu Ancient Stone City, located on the southern tip of Chongwu Peninsula in Fujian Province is a national heritage conservation site in China. The Chongwu ancient stone city is one of the seven famous ancient city walls in China. Its historical records trace the construction of the origin of the City to defensive fortification back to the year 1387 A. D., during the reign of the Ming Dynasty. Therefore, many experts are also eager to visit for historical research. Nowadays, Chongwu Ancient Stone City is popular with travelers. 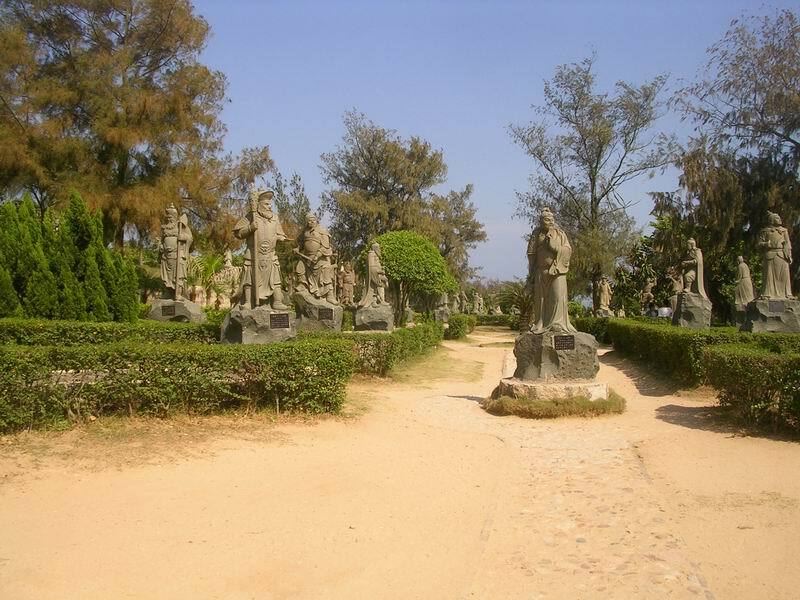 Most people visit for its Stone Carving Park, which can be considered a museum of stone carvings. The Stone Carving Park was built beside and on the beach, taking up a total area of 9 hectares. The stone carvings there are of a large variety and possess profound meaning. Those stone carvings show the charm of nature and they record the history and culture of Chongwu and China. West-Gulf Resort: West-Gulf Resort, located in Hui’an County, China’s famous "Charming Ancient Town", on the seashore of Chongwu Town, is a large conference centre and resort hotel and is built in accordance to the international five-star hotel standard. A buffet breakfast, like those found in all 5 star hotels in China, is included in the price, and you will definitely feel it's a good value for money once you have ‘pigged out’, lying in the deckchair by the swimming pool with beaches just metres away. The hotel combines beaches and seashore natural resources with modern design and a garden landscape to achieve the perfect combination of man-made structures and nature. The resort has large parking lots, and a multi-functional conference centre with a built-in system of vocal language translation for simultaneous interpretation. The resort has Chinese and western restaurants and open-air bars which provide delicious foods. The resort has luxurious sea-view rooms, a variety of healthy recreational programmes, all kinds of entertainment activities on the sea and ultra-luxurious Crystal Palace entertainment center facilities including a gym, indoor and outdoor swimming pools, a chess & mahjong hall, a KTV, a beauty salon, and a spa center. Other entertainment programmes include billiards, tennis, table tennis, beach motorcycle, and marine motorcycle. When visiting Chongwu, you cannot miss the factories that supply stone carvings, masonries, floorings and the shops that supply stone handicrafts, souvenirs and more. There are hundreds of large and small stone companies scattered across the city, and they produce a wide range of stone products and handicrafts, including tombstones, European-style decorations, sculptures for parks and temples, animal images, figures of people, construction materials, etc., which sell as far as South Asia, the USA, Europe and other countries and areas. Its neighboring town, Shuitou, is also famous for its high-quality and wide-range of stone products. There are more than 600 stone companies in this small town of just about 160,000 people. However, it has gown into the No.1 stone production and trading base in China in the past 20 years, with stone production accounting for 40% of nationwide production and its exports taking up 45% of nationwide exports of stone products. 40% of national stones are manufactured and processed in Shuitou, and more than 70% of the sales being dominated by Shuitou people. Its stone industry cluster ranks first among the top 10 industry clusters of Fujian Province. The Minnan No.1 Building Material Market has grown into the largest “Stone City” in China; all varieties of stones from all over the world can be found in Shuitou. The China (Nan'an) Shuitou International Stone Exhibition is held here in November each year, attracting thousands of stone companies and businessmen from all over the world.. Oyster houses in Xunpu: Kekecuo houses have a long history which can be dated back to the Qing Dynasty. They are of high artistic value and only scatted in Xunpu Village, Quanzhou. Kekecuo houses have a long history which can be dated back to the Qing Dynasty. They are of high artistic value and only scatted in Xunpu Village, Quanzhou. Kekecuo houses are covered with big oyster shells. Unlike the shells in local areas, the shells on Kekecuo houses are bigger. According to the instruction of some experts, those shells are from Africa. To build a Kekecuo one needs excellent artisanry. Before building it, there is some preparation work needed. First, the builder should consider the ride of the house and build at the request of the house-owner and make the design. Second, select the shells according to design. Third, the shells should be washed and sorted. A well built wall of a Kekecuo house is like a fishscale; in good order and unique style. It is really a wonderful work of people's effort and intelligence. 1. Although it’s not known for its beaches, there are small beaches perfect for a day of camping or having a picnic. 2. Consult Apple Travel for the tour if you need driver and tour guide, they are the best in town and they have guides who speak English.